No more getting up in the middle of the night to turn your eggs or accidentally forgetting to turn them. This new and completely automated turner will turn your eggs four times daily and will take the worry out of incubation. Research has shown that eggs that have been turned correctly and consistently will have superior hatchability. We’re sure this Automatic Egg Turner will give you more chicks per eggs set. Easy to follow instructions are included. 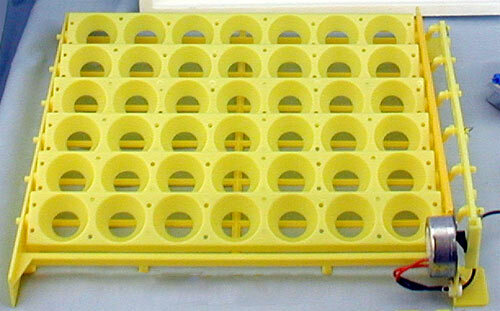 It comes with a chicken rack that holds 42 large chicken or partridge size eggs. Each turner has 6 racks for eggs.